One of the best historic places I love to visit in Hanoi is the earliest university in Vietnam: Temple of Literature or Van Mieu Quoc Tu Giam. This typical traditional school has been the honor of studious spirit and educational achievements of Vietnamese students since ancient times. 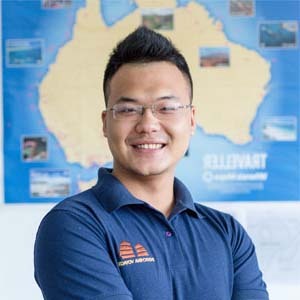 Founded by King Ly Thanh Tong in 1070 in the decades after the establishment of Hanoi as Vietnam’s capital, it became the site of the country’s first University, Quoc Tu Giam in 1076. The opening hour is 8 am- 5 pm from November to March, and the rest of the year it opens from 7.30 am to 6 pm. 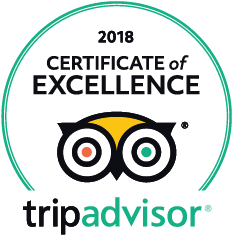 Also the ticket price for both Vietnamese and foreigners stay the same with 20.000VND for adults and 10.000VND for kids. When walking into Van Mieu, the most notable feature I can always enjoy felling is the number of trees here, some are freshly green; some are shaped together into several giant books which you can refer to the real ones students used in the past. 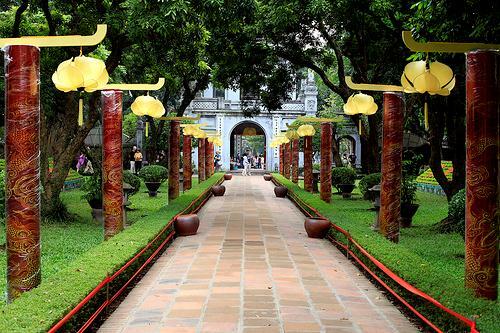 Moving on you will see Khue Van Cac that is chosen to be the symbol of Hanoi. From here a new place has been open up to your eyes with special stone steles which are famous worldwide. 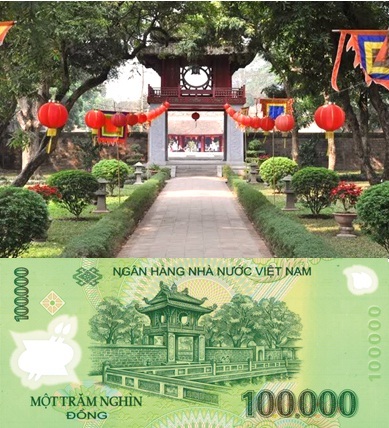 An interesting point is that you can easily find this “Constellation of Literature pavilion” printed on the back side of the 100,000 Vietnamese dong banknotes. Van Mieu is not only an attractive travel destination for tourists but also a “faith temple” for national students. 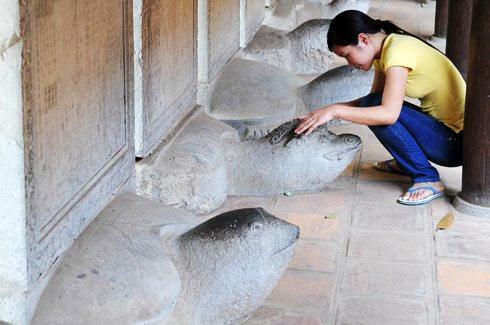 Annually students across Vietnam come here to touch the heads of tortoises to get luck for their exams; however, recently a law has been passed on by the government to ban people from doing this due to the fear of ruining these traditional values. In Van Mieu Quoc Tu Giam local people worship Mr. Chu Van An as he was the first principal of the first university of Vietnam. He was also among the greatest teachers with outstanding talent and his kind heart to educate people. 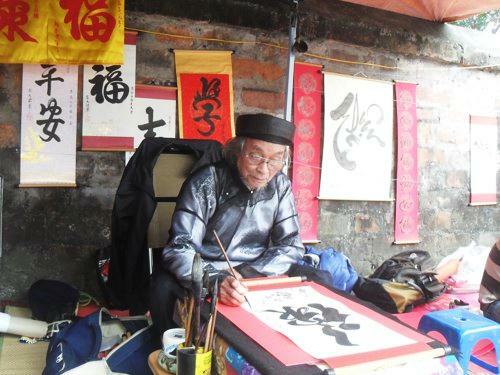 Every year Vietnamese people come to pray for the best of their studies, for visitors they come to see another traditional signature that has been preserved for years. Outside the temple, exclusively during the Tet Holiday, there is a person called Ong Do who gives people ancient Vietnamese words in order to receive luck for the upcoming year. Once you come to Vietnam, especially during Tet Holiday, you should not miss a chance to visit Temple of Literature to see yourself as one of the most noticeable life routines of Vietnamese people!